Few meeting rooms are themselves suitable, or come equipped with the facilities, to allow for high-quality simultaneous translation. Therefore it is best to rent interpreting booths from duvall. Interpreting booths create an ideal working environment, allowing interpreters to really immerse themselves in the meeting and to access all of the information they need to provide flawless simultaneous translation. Headphones allow interpreters to listen to the speaker, and as they are physically present in the meeting room they can see the speaker, the participants, the projection screen and everything else that is happening. At the same time, the booths make sure that the interpreters do not disrupt the proceedings. Using mobile interpreting booths, we can provide simultaneous translation in most rooms. There are very strict ISO standards for interpretation booths that safeguard the quality of the simultaneous translation and the comfort of both the interpreters and the participants. These standards cover matters such as the dimensions of the booth and of its windows, the walls’ sound absorption, and the power of the ventilation. 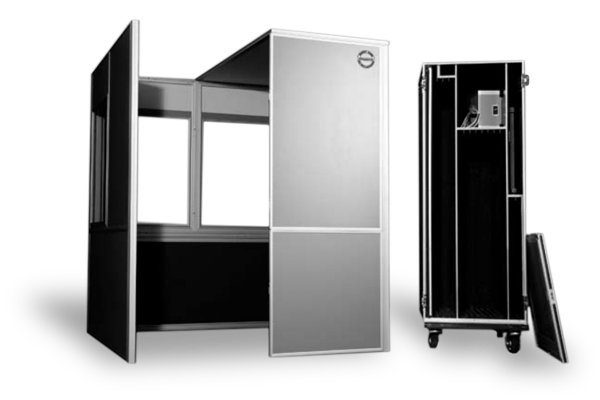 duvall’s Audipack Silent booths fully meet these standards. 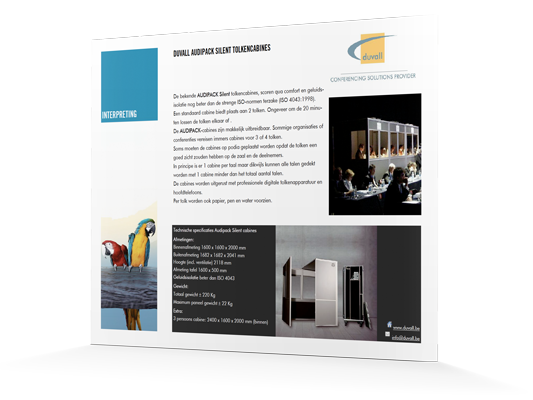 The comfort and acoustic insulation provided by the well-known AUDIPACK Silent interpreter booths are even better than the strict ISO standards (ISO 4043:1998).8). A standard booth accommodates 2 interpreters. The interpreters take turns and swap about every 20 minutes. The AUDIPACK booths are easy to expand. After all, some organizations or conferences require booths for 3 or 4 interpreters.